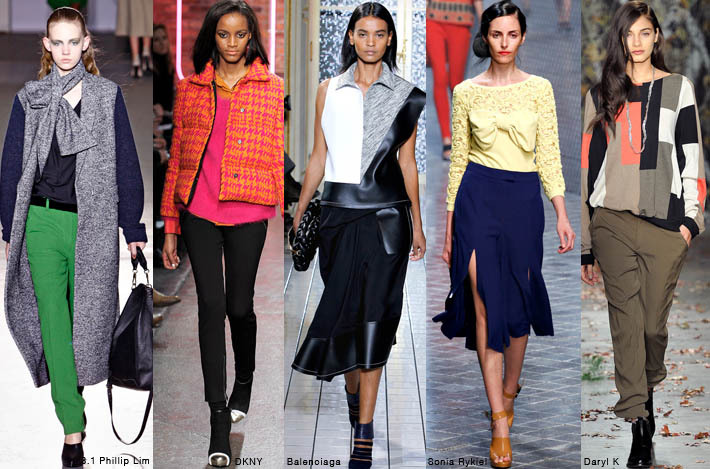 Color blocking is a great way to add some pizzazz to your look. Color blocking can be achieved in two ways. Go the easy route and purchase pre blocked items such as a top, cardigan or dress. The second way is to purchase several items in different colors and wear them together. The simplest way to blend colors are by mixing neutrals and basic colors with brights. Two out of the main pieces in your outfit can be black and white or brown and beige. Then pop it with a bright green, pink or coral. Also try color blocking with neutrals only. Try black, white and grey or black, Brown and Beige. Mix and match similar colors such as blue and green, red and pink for a monotone look. Don't mix a pure green and a pure blue. Make it interesting by pairing colors like turquoise and royal blue. If you're bold enough, go for contrast. Try purple and orange, green and pink, blue and yellow. Wear neutral-colored accessories or go all out and throw in a pair of bright shoes or handbag into the mix. Avoid adding complex prints such as florals to your look. Wearing more than three colors at once is already a lot. Let color blocking be your story and leave it at that.